Now legal in 47 states. As one of the more consistent competitors on the jiu-jitsu circuit, we've seen Jesseray Childrey take the mats at events as diverse as EBI to ADCC. But this weekend, Jesseray was able to take home the big prize at the third installment of Ultimate Mat Warriors in San Diego. With a strong combination of arm and leg attacks, Jesseray was able to take home a belt to his home team of Nice Guy Submission Fight team (along with a cool $2,000 in prize money). We got the chance to catch up with Jesseray and ask him a little bit about his journey, as well as what goals he has in store for the year 2018. Twitter exchanges are pretty standard for fighters. Sometimes you need to get the hype train started, or get people interested in seeing you have a big match against someone who talks too much trash. Often times, however, the trash talk derives into elementary elements. Such was the case when UFC fighter Cris Cyborg decided to not just throw shade at an opponent, she decided to actually bring up her opponent's immigration status. Let's start here. Cris Cyborg is a popular fighter within the UFC who has become the current face of women's MMA. With a dominant performance at UFC 219 to close out last year, it became pretty apparent the UFC might not have a next option for Cyborg. One name that did come up, however, was Amanda Nunes -- an equally dominant fighter who has racked up impressive wins over Ronda Rousey and Miesha Tate. The fight was all the more notable considering that Nunes would be fighting up a weight class. On paper, it's the kind of fight that would make just about everyone happy. That is, except for Megan Anderson. Sage Northcutt is one of the most polite, clean cut MMA fighters out there. He also looks like a modern day Zach Morris, but that's beside the point. The dude has a promising MMA career and has racked up an impressive set of wins as a UFC star. Which begs the question, why would a kid with so much promise want to halt the momentum he's built up in the world of mixed martial arts? Because, like any other red-blooded American, he's trying to score a role in the umpteenth Rocky movie. The UFC closed out the year in stunning fashion as two of their biggest performers were able to deliver in the main and co-main event. But by the end of the evening, Cris Cyborg and Khabib Nurmagomedov came out victorious with the type of performances that made you say quietly to yourself, "what the hell are they supposed to do next?" In the co-main event, Nurmagomedov channeled a relentless energy inside the octagon and never once let Edson Barboza into the fight. And we're not just talking any lightweight contender, we're talking about Barboza, an individual who had a 19-4 record with prominent wins over fighters like Gilbert Melendez, Anthony Pettis, and Beneil Dariush. But at UFC 219, Nurmagomedov was able to make Barboza look so ineffective one of the judges rewarded him with a rarely seen 30-24 decision. Which, yes, Barboza made it all the way to a decision -- which might make it sound as if what Khabib did was all the less impressive. Except it was one of the kinds of fights where you actually were hoping that they'd call it, numerous times, due to Khabib just smothering Barboza and overwhelming him with technique. If you are unfamiliar with RIZIN, then allow me to make an impassioned plead for you to take an active interest in this Japanese MMA fighting organization. To begin, RIZIN shares some executive DNA with the guys who made PRIDE Fighting, the longtime rival organization to the UFC. While you likely may have never seen a fight from PRIDE, it did attract a huge cult following who loved seeing MMA take place in a ring, rather than the Octagon we know and love. But the second trademark thing about PRIDE was the annual New Years programming. Those who were cool (or "in the know") would stay up all hours of the night here in the states to catch a glimpse of the fights. RIZIN has continued that tradition of showing off the organization's penchant for colorful personalities and entirely bat-sh*t fights. Don't believe me? Just look at at the following photo and tell me if this is your ordinary MMA weigh in. Boxing is one of the most grueling sports in the world. We know that fighters often prepare to go 12 rounds, so their cardio has to be at a level that most people will never even experience. So it's always a bit of a surprise when a fight ends quickly. For the person who lands a knock out, it's the moment preparation meets opportunity. And for the person who gets knocked out, it's a bitter moment that underscores months (sometimes, even years) of preparation. So when World Boxing Organization's bantamweight champion Zolani Tete stepped foot in the ring this past weekend, he might have even surprised himself when he put his name in the record books. There are entire chains of the internet that are devoted to Jeff Goldblum -- and rightfully so. For the better part of the 90's, Goldblum entertained the masses as one of the reliable scientists to get us through some of the most unimaginable threats of dinosaurs and aliens. And through the right combination of nostalgia and memes, Goldblum has once again found his way into the popular culture. 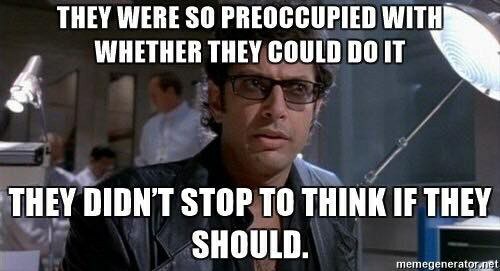 But among a sea of Goldblum gold, there is quotation from Jurassic Park that always seems to work well when presented with controversial ideas. A few weeks ago, Colby Covington decided to embrace the role of being a heel. After defeating home town hero and grappling legend, Demian Maia, Covington went after the Brazilian crowd and called them a bunch of "filthy animals." For added fun, he decided to call the country a "dump." Naturally, that didn't sit well with the crowd. Or a number of Brazilian UFC fighters. Or the UFC for that matter. But Covington decided to run with his newfound 15 minutes of fame, citing the oft used "hey, I'm just selling the fights and having fun defense." One person who failed to see the fun of it all, was former UFC Heavyweight champ, Fabricio Werdum. Covington was on hand for the UFC's Australia event going on over the weekend and happened to run into Werdum who happened to have a boomerang on hand. Ask me if he threw the Boomerang at Covington. Please. I beg of you. By all accounts, Conor McGregor gets preferential treatment in the world of mixed martial arts. The UFC literally lets him do and say as he pleases, and still gives him some of the best deals the company has to offer. The boxing world allowed him to make jokes at the expense of Showtime executives without any kind of consequence. And the movie world even indulges and embraces his cult of personality (he has a documentary coming out via Universal Pictures after all). Yet, that's part of the carefully staged persona that McGregor has carved out for himself. Be the center of attention and captivate the masses. And it's worked out pretty well for him. That is, until last Friday afternoon. While making a visit to Bellator 187 (the WCW equivalent to the UFC's WWE), McGregor made a big splash when he went into the cage a little too early to congratulate one of his fellow training partners Charlie Ward. 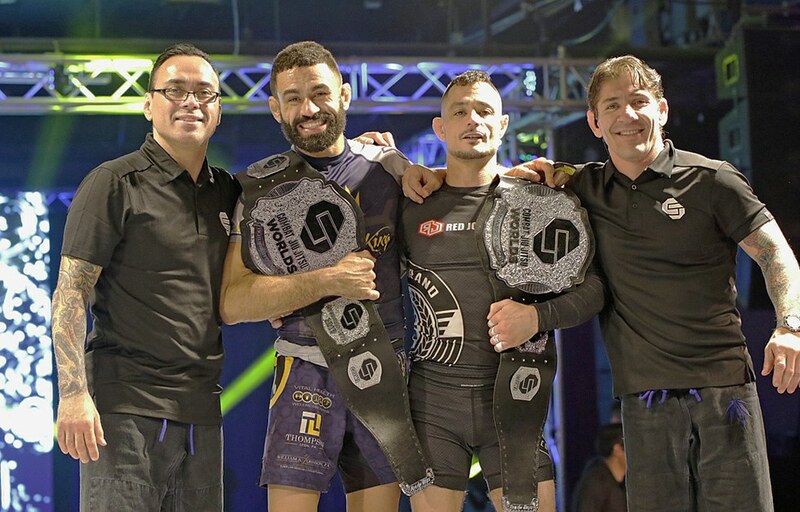 After starting as a featured attraction at EBI 11, Combat Jiu Jitsu was given it's first opportunity to thrive on its own. Growing from the four person tournament format that have been featured as the appetizer in between matches at the Eddie Bravo Invitational, this was the first time we got to see an entire card filled with just combat jiu jitsu matches. And what started with a legendary first match between JM Holland and Chad George last February, expanded into two eight man tournaments at the 135 and 155 weight class divisions. The event was able to take a little bit of the magic that made EBI so unique and add a few new twists and turns to the combat style that we've previously seen. On a night where millions would be tuning in to watch if Georges St. Pierre still had the ability to perform in the octagon, a number of fighters here in Southern California packed the house at the Sportsmen's Lodge in Studio City to put on a night of equally thrilling fights. It's never easy to be told that you'll be fighting on the same night as one of the biggest UFC cards of the year, but in MMA it seems there's always another card going on. Yet, none of that even remotely mattered as a number of CXF's biggest stars came together to put on one of the more memorable nights of fighting in some time. Led by performances from Rich DeLeRoy, Vince Cachero, and Milton Arguello the CXF 10 card not only impressed, but it continued a solid tradition of match-making and heart that has come to define the company. From the inception of the Eddie Bravo Invitational, Garry Tonon's presence (and by a larger extent, the Danaher Death Squad) has helped to shape the type of excitement and action we've come to expect from the premiere sub-only showcase. And at last Sunday's event, we saw Tonon take home a championship for a record-setting fifth time. Forget the fact that Tonon has accomplished this feat in no less than three different weight classes (155, 170, and, hilariously, 205), there's a real excitement in watching Tonon and the DDS do their thing on stage. The precision and athletic talent demonstrated by this East Coast crew is something to behold. Whether you're a fan or not, it's hard to argue with the results or the way it comes across on the television. The Danaher Death Squad is never short on thrills. Well, chalk this one up as one of the most effective ways to cut a fight promo. UFC fighter Mike Perry showed his true love for Halloween by punching and kicking a whole bunch of pumpkins. I am not exaggerating, nor am I overselling it. Perry literally gathered some pumpkins together, asked his girlfriend to politely hold a few of said pumpkins in hand, and then proceeded to kick the living crap out of those pumpkins. And if I'm being honest, it was one of the most entertaining gimmick promos I've seen from a UFC fighter in some time. Colby Covington had an amazing night in the octagon Saturday in Sal Paulo. He looked sharp in a fight against Demian Maia, out-striking the jiu-jitsu legend and rendering him unable to secure a takedown throughout the entire fight. He not only made a statement that he deserves top-tier talent in the welterweight division, but that he might make for an exciting fight against the current champ, Tyron Woodley. So with all that in mind, how exactly did Covington manage to kill a portion of the fight game that he so skillfully accomplished in dominant fashion? When a fighter without a sense of wit decides to go full-heel on the hometown audience. Play-by-play commentary is kind of a thankless job. For years, the gold standard of MMA, Mike Goldberg and Joe Rogan, were occasionally mocked by fans for slip ups and silly moments on air. Only in retrospect, however, do those silly moments pale into the comparison to the strange combinations the UFC is auditioning today. In the months since Goldie has been off the UFC airwaves, the organization has tried pairing up Rogan with the likes of Jon Anik, Dominick Cruz, and Daniel Cormier. The later, a current light heavyweight champ, were recently called out, however, from a fighter who felt that he was disrespected on the mic. Listen, I never thought I'd be the type to cover a fighter throwing an extravagant party for his kid, but Conor McGregor is once again changing the game and, by proxy, forcing my hand. I just happened to see a photo of the McGregor clan and thought, "aw, good for Conor and his family -- wait, did he spell out his son's name in bright lights amidst a beautiful castle backdrop." Yes, yes he did. In retrospect, I was foolish to think this could happen any other way. But let's examine the evidence. If there's one thing we know about Vince McMahon, it's that he's an insanely competitive. He's not just the P.T. Barnum of the sports entertainment world, he's also the guy who cuts shrewd deals to protect his intellectual property and investments. Just this week, the WWE ordered cease and desist orders to indy wrestlers who used "trademarked" gestures and slogans. Yep, you can't do this without upsetting the WWE. So it probably wouldn't surprise you to hear that McMahon had a bit of a rivalry with UFC President Dana White. A respectful one, as per White, but still one that the WWE refused to do business with the UFC. That was until the WWE lent megastar Brock Lesnar to the UFC for a one-time special deal last year to fight Mark Hunt.